The chairs I grew up on, did not move. Well, they did sometimes by accident. You scraped the chairs over a wooden floor or got them caught on a woolen rug, or you tipped them back and someone yelled at you. Not me. I don’t remember tipping my chair, but someone did — a friend, a classmate — and another someone yelled. Don’t tip your chair! But out west in Ballard where my grandmother and her sister lived, the chairs moved. The first chair was my aunt’s rocking chair that sat in her tiny pink house. Her small perfect garden abutted my grandmother’s much larger, more ostentatiously tended one. I would go through the gate separating the two sisters and their properties – the idea of crossing from one garden to another fascinated me. And the gate wasn’t even locked. You lifted the latch and suddenly you were in another place altogether. I could come and go anytime of day — from sister to sister, from rose to rose. My grandmother’s big lawn, and my aunt’s diminutive one — her sitting on a step in her shorts getting ready to weed. Then into her little fairy-tale house, and there was the rocking chair. I sat in it and visited with her. 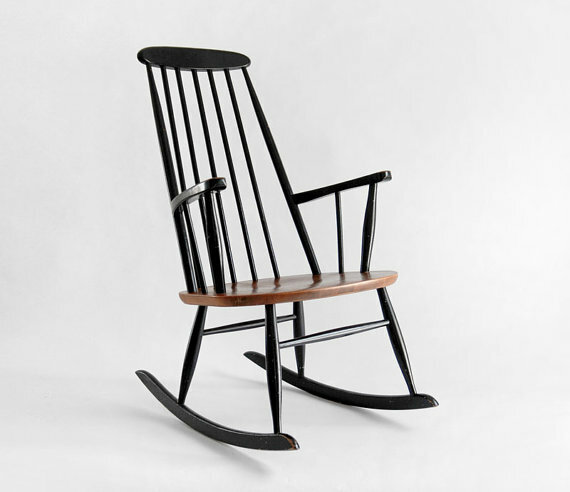 I visited every day.The rocking chair was wood, plain, and yet wonderfully comfortable and best of all it moved — it was supposed to tip. One time I travelled across the entire living room. “You’re gonna rock yourself right out of here!” my aunt observed smiling. She had a disease that froze half her face and her smile was lopsided as a result, but it always was funny and warm — always wonderful. We moved the chair back to its place, and I started up all over again. “You’re gonna rock right out of here!” All this before rock and roll, although I guess – looking back this rocking must have been coeval with Elvis. The other chair that moved was my grandmother’s swing. It was not a plank of wood that hung from chains. 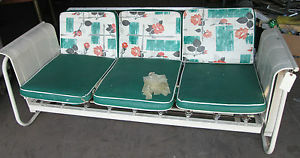 It was like a sofa or a seat from one of those really big old cars. It was aqua and draped with a plastic sheet when not in use in the garage. When we came to visit the “conversation about the swing” was had. “Do you want to bring out the swing?”, my grandmother said and there was something magisterial about the question. And then my father echoed her, saying, “shall we bring out the swing?” They seemed to have some secret signal — like parents and children do — and so my father pulled it out, took of the plastic sheet, and the smell abated and we sat on it. Without ever answering the question. We sat outside at night. This was also an amazing thing — as amazing in its way as the gate that led between the gardens. Sitting outside at night, was something I never did. None did it except for vagrants or frightening people, and anyway where would one sit in the city? If you went outside you did it for walking someplace during the daytime, for walking your dog, or going to the dentist, and perhaps you’d sit on a park bench. As a pause between activities. But this sitting outside in your yard in the dark was something. The smell of evening. The way summer evenings in the west get cold but not buggy. The silence of night. The swing made a gently creaking noise. You could hear crickets. You could see stars.